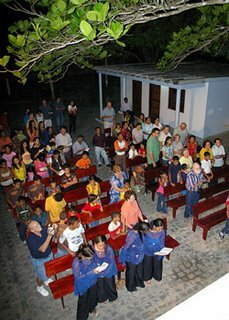 In a service which blended two cultures and languages, American and Brazilian friends of Mark Mayberry gathered at the boys orphanage in Maceio, Brazil to dedicate a building in his honor. It was all part of an effort to remember the Joplin man, who died in May. 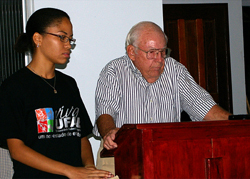 Through an interpreter, speakers talked about Mayberry and the legacy he established with his desire to help the children of Brazil. The service, set under the evening sky, took place in the courtyard in front of the newly named “Mayberry House.” Leaders opened by singing “Amazing Grace” and “Jesus Loves Me” in a mixture of English and Brazilian languages. 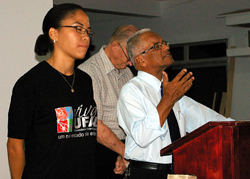 Wayne Wood, president of the board which operates the orphanage, opened the service with two Bible passages, Philippians 1:21 and 2:3 which, he said, “spells out exactly” Mayberry’s life. The passage from Philippians 1:21 talks about living in Jesus, while the passage from 2:3 talks about living a life free of selfishness and with humility. “Mark went to be with the Lord,” Wood said, “But the impression he made in this country, is a great blessing to all of us. Wood said he counted it a privilege to have known Maybery. “It [our friendship] was a special blessing, he was a special friend,” Wood said. Bob Arnce, Joplin, also spoke about his friendship with Mayberry. Arnce said he and Mayberry often roomed together on mission trips. The pair would close their late night discussions with a passage from Psalms. Arnce read from Psalm 1, which talks about the character of someone who follows God and lets their roots grow deep, like a tree planted by water. “I thank God for Mark Mayberry, for his inspiration and the example he passed on to me,” Arnce continued. “Tonight this service is about dedicating a building to these children and dedicating it in the name of Mark Mayberry because of his interest in this place,” Wood said. 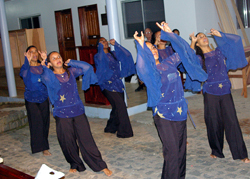 The service concluded with a prayer of dedication, spoken in Portuguese by Pastor Jonas and an interpretive dance performed by young women representing a church in Nascente.